In book publishing specifically, I hear again and again that “Quality rises to the top.” I don’t think that’s true in book publishing, but let’s say it is. Is it true for online-driven content? And if not, what should online publishing business models look like? How can a publishing business model can be successfully based on engagement (which Medium has turned toward—how long people stay at the site or keep reading?) rather than page views? Gaughran has been an outspoken (and accurate) critic of Author Solutions (ASI) for a while now, and all of his posts covering ASI are worth reading. If you don’t know about ASI, they’re the largest provider of self-publishing services in the world, with many brand names (AuthorHouse, iUniverse, Xlibris, Archway, Trafford, and others). Crunching the numbers, Gaughran reports on how much he estimates ASI is earning by selling marketing packages that have terrible return on investment. I look forward to reading part 2. If you know anyone considering ASI as a service provider, make sure they read Gaughran’s posts before committing. The company is facing a class-action lawsuit as a result of its questionable business practices. One wonders how much that does or will affect its business and reputation. Penguin Random House is now the owner of Author Solutions. One also wonders how concerned they are about the reputation or business practices of the company—and how they envision its future. Every year, Meeker covers trends in Internet usage and growth. 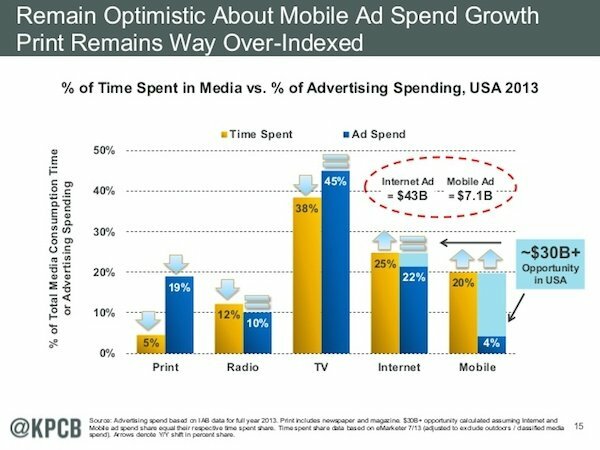 One of the slides that is always passed around is this one—showing the % of attention for each medium versus the % of ad spend it enjoys. Note the polar opposites: print & mobile. As usual, print is down in attention and ad dollars from prior years, though it seems to get more attention than it deserves. Also: no one has really figured out how to do effective mobile advertising. The biggest one: Who’s going to figure out how to monetize mobile through advertising? Does print deserve the ad dollars it’s getting? Let’s say I’d like to keep the format/length of this column the same as it is now. How would you prefer I describe it in the intro to be accurate and not misleading? 1. Carefully curate a selection of articles from the past week that I think deserve attention and aren’t a waste of time for an author to read and understand. I’ll rephrase the introduction. I think it might be confusing to put the questions before the article, however. For the sake of clarity in the ensuing discussions, as well as my convenience when scanning, I’d prefer to see the three articles with your relevant questions separated into three different posts. That’s just me, and I’m not a regular commenter. They might work better separately in a mobile format, too. I like the distinction between quality and popularity—and if the popularity is short-lived or delayed. The question of fostering talent comes up a lot in discussions of what value/role traditional publishers play. Some argue they still play a critical role, while others are fairly certain that role has been abandoned. But it’s fairly clear mid-list authors are increasingly leaving (or being forced to leave) to foster their talent/career on their own. Have you read Lewis Hyde, The Gift. It’s an oldie, but fits well with your comment. When a girl starts at a new school she might feel the jitters. But if she falls in with the popular crowd right away then she’ll probably rise up in the social rankings quickly, and much faster than she normally would have otherwise.